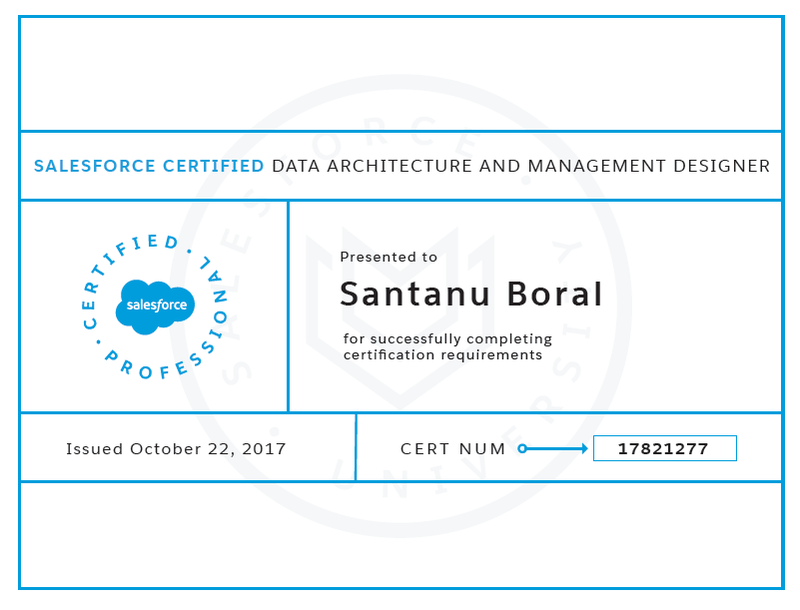 Today (22nd Oct'2017), I have successfully passed Data Architecture and Management Designer (SU17) and acquired Salesforce certified Application Architect credential. I have faced total 60 questions. Unlike Sharing and Visibility exam there are no additional questions. It has taken around 100 hours of preparation mostly one and half months time frame. Delivery options: Proctored exam delivered onsite at a testing center or in an online proctored environment. Click here for information on scheduling an exam. References: No hard-copy or online materials may be referenced during the exam. Before I started my preparation, I have prepared a document and noted down all the points and advice mentioned by these guys. Thanks to all of them. Validation rule, workflow rule, outbound message. 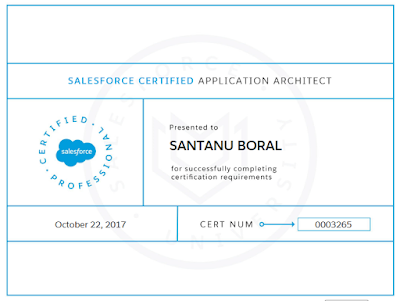 By the way, Salesforce recommended training guide doesn't cover 100% areas of the exam. Around 10-15% of the questions were outside of the material which I could assume so far. Recently we have received a business case to perform a webservice callout from our Custom Visualforce page. There are following ways we can make callout from Visualforce page. From visualforce page, first we will verify all standard and business validations and then perform callout and any error message during save will be displayed on the UI. For example if Customer Name is blank if will show the error message in the UI and will not perform callout. From commandbutton action, save method will get called. In the save method, it will verify if customer name is blank and show the error in UI, otherwise call performRestCallout(). (3) Create a custom object/setting, add the message to that and write a visualforce page for the sidebar that displays the message. Salesforce doesn't allow to commit data and perform callout in a single transaction as it will throw error message "Uncommited task is pending". The following approach works well. Now, what will happen if during save, UI validation and business validations to be performed and if any error occurs that needs to be shown on UI and will not perform oncomplete call. Secondly, since it is synchronous call, so any exceptions or errors returned from webservice call must be displayed on the UI. Here is the most tricky part (where I have spend hours to find the work around, finally Eric from StackExchange helped me retaining the error message in UI. My question & Eric's answer). Here conditionally oncomplete needs to be called. So hasError property has been defined on controller. Save method will perform validations and then will commit the changes into database. If Customer name is blank then it will show error message. //commit all data here, not giving full code for simplicity. Just a simple method and if any error occurs it will be propagated to calling method and finally be displayed at UI. Which approach to be taken for implementation it will be based on business scenarios, data volumes, performance and that is a separate topic all together. Here, I have tried to put my proof of concepts and approach to perform callouts from Visualforce and necessary error handling. Salesforce MVP | 18x certified | Salesforce certified Application Architect, System Architect, Platform Developer II, Sales Cloud Consultant, Service Cloud Consultant, Commerce Cloud Digital Developer, Field Service Lightning Consultant. ------------------------ Earned Apex Specialist, Lightning Experience Specialist, Security Specialist, Reports & Dashboards Specialist Superbadges.